One Eternal Day: "Beautiful, stirring, and perhaps socially beneficial"
"Beautiful, stirring, and perhaps socially beneficial"
Richard Grenier's conclusion after reviewing the film Gandhi (1982): "I have consequently given some thought to the proper mantra for spectators of the movie Gandhi. After much reflection, in homage to Ralph Nader, I have decided on Caveat Emptor, 'buyer beware.' Repeated many thousand times in a seat in the cinema it might with luck lead to Om, the Hindu dream of nothingness, the Ultimate Void." .... 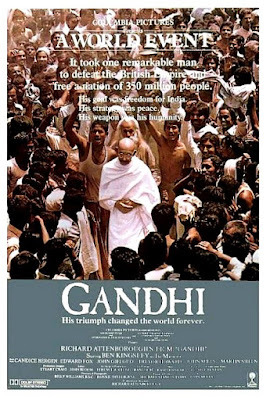 When the lights came up I fell into conversation with a young woman who observed, reverently, that Gandhi’s last words were “Oh, God,” causing me to remark regretfully that the real Gandhi had not spoken in English, but had cried, Hai Rama! (“Oh, Rama”). Well, Rama was just Indian for God, she replied, at which I felt compelled to explain that, alas, Rama, collectively with his three half-brothers, represented the seventh reincarnation of Vishnu. The young woman, who seemed to have been under the impression that Hinduism was Christianity under another name, sensed somehow that she had fallen on an uncongenial spirit, and the conversation ended.